We're still on holidays so this will be bare bones. The RSS feed will not feature the July KeithSpeak link until my return because I don't have Web access to the XML code. Sorry. Happy Canada Day, happy soon to be 4th of July. Ok, that's all for now - my beer is getting warm. Well, we've been gone about a month now. Work is a distant memory, obligation is a foreign term, the future is always now. Frankly, none of those are bad things to live with. Quite the opposite actually. Shame one has to leave home to discover that. Bravo to all those who created, participated, watched and learned from the globally broadcast Live Earth concerts. Jeez, no matter where you are on the planet, you can't escape the detestment and universal revilement of George Bush. His failed policies, his hubris, his ignorance - all called into question. America, why has this moron not been impeached? On the move again. Heading back toward British Columbia. Our holidays are winding down. Fresh content looms. Oh boy. Rain and more rain. The weather has saved the worst for last. Sigh. Just got back. Ahhh. Been gone for 6 weeks to the day. I've updated the webfeed. Ta for now. 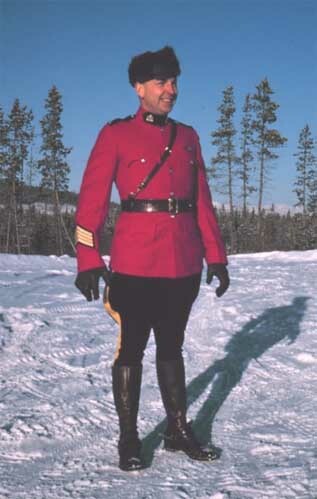 When the Mounties heard that we were back from our holidays, they sent out their happiest constable to welcome us home. Bloody civilized, no? I love this country. I had a whack of vivid dreams last night. Woke up to find my brain emptied. I’ve got nothing to say. I’m in that scrumptious place where I have no work lined up. I’m available without restriction. It's Keith unencumbered. I find it to be delicious. Lots of people would be anxious about such a situation. Lots of people would be distraught. Not me. I’m wide open to doing anything that interests me – how could that be a negative? In an effort to counter sagging public indifference and tap into “today’s hipster youths“, NASA has redesigned their space suits to “up the cool factor” and "generate some heat". I question how the whole retro space diaper look will play with Gen X, but it is rocket science, so what do I know? Apparently not much. After yesterday’s post I got an angry call from Ali Janorp Depreme, the haute couture designer of the new NASA space suit. Mr. Depreme assured me it was the height of chic and made of a most "yummy" fabric and obviously I was a cretin for disparaging his creation and he spat at the notion that it was a space diaper of any kind. He told me I knew nothing about beautiful space clothes and that he himself would be proud to wear it into space if only his poor health would allow him to "escape this tortured earth", oh and if he wasn't the sole support for his also sickly mother who would "absolutely die" if he weren't there for her every need. On a roll, he went on to disparage my family and hung up in a snit. Well. Goodness. Jeez. Designers. An old friend from California is set to visit today. We met in the Yukon. I knew him when he lived in Sacramento, and then later when he lived in Idaho, and Alaska after that. I knew him through the years he lived in Russia. But now he’s back in California. Soon to be in British Columbia. It’ll be swell to see the much traveled him. Showing friends who don’t live here, where we live, has made me more appreciative of how nice it is to live where we live. From there it’s just a small leap to sweeping generalizations: if only all the other people in the world were as happy to be where they are as we are to be here, why, what a wonderful little planet this would be. I dunno, is that too gushy? Maybe next month I’ll be here for the whole month. Get some continuity going. Pick this up some.